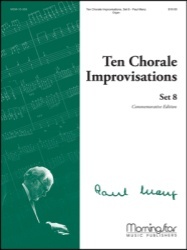 Set 8 of the commemorative edition of the Ten Chorale Improvisation books that made Paul Manz such a well respected composer. Written over a period of time from 1968 to 1980, and include some of the most well-known works of Paul Manz. Each volume contains a biography of Dr. Manz, full indexes of his complete works as well as historical information.